PL Medical is pleased to have received accreditation from the National Voluntary Laboratory Accreditation Program (NVLAP), administered by the National Institute of Standards and Technology (NIST). NVLAP has assigned Laboratory Code 200666-0 to PL Medical, indicating that our laboratory is in compliance with criteria set forth in NIST Handbook 150:2006 and NIST Handbook 150-4:2005, all requirements of ISO/IEC 17025:2005. PL Medical has been evaluated and deemed competent to process the radiation dosimeter listed below through employing a Panasonic Automatic reader model UD 710A. Also, we are accredited to process the following dosimeter by virtue of actual demonstration of compliance with ANSI/HPS N13.11-2009 through testing. Panasonic TLD model UD-802 in a 802-1 PL Medical holder for ANSI/HPS N13.11-2009 categories IA, IIA, IIIA & IVAA. Accreditation is granted following successful completion of a process which includes submission of an application and payment of fees by the laboratory, an on-site assessment, resolution of any deficiencies identified during the on-site assessment, participation in proficiency testing, and technical evaluation. The accreditation is formalized through issuance of a Certificate of Accreditation and Scope of Accreditation and publicized by announcement in various government and private media. NVLAP has Mutual Recognition Arrangements (MRA’s) with international accrediting bodies around the world which recognize NVLAP accredited calibration laboratories. More information about the NVLAP program and MRA’s can be found on the NVLAP website. 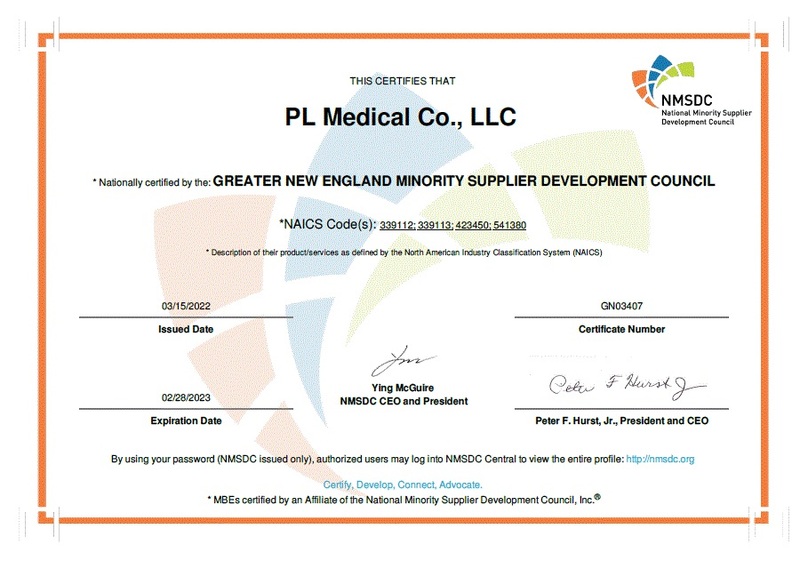 PL Medical is certified by the National Minority Supplier Development Council. Our certificate number is GN03407. The National Minority Supplier Development Council (NMSDC) provides a direct link between corporate America and minority-owned businesses. NMSDC is one of the country’s leading business membership organizations. It was chartered in 1972 to provide increased procurement and business opportunities for minority businesses of all sizes. More information regarding the GNENMSDC can be found on the GNENMSDC website. PL Medical is a proud member of the Healthcare Suppliers Diversity Alliance (HSDA). The HSDA works to lead healthcare supplier diversity by building awareness through education and creating pathways to potential opportunities for historically underutilized businesses and all healthcare supply chain stakeholders. More information regarding the HSDA can be found on the HSDA website. 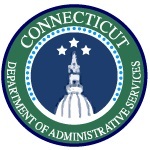 The State of Connecticut, Department of Administrative Services, Supplier Diversity Program has certified PL Medical as a Small Business Enterprise (SBE). 10,000 Small Businesses is a philanthropic initiative launched by Goldman Sachs and the Goldman Sachs Foundation in November 2009 that pledges $500 million in various aid to small businesses in the United States and United Kingdom. The initiative aims to provide 10,000 small businesses with assistance – ranging from business and management education and mentoring to access to capital and business support services. To view PL Medical’s U.S. Food and Drug Administration Establishment Registration & Device Listing (Registration Number 2435343) please follow the following link to the U.S. Food and Drug Administration website.